So how was your Christmas this year? Did you have fun? Did you give in to the spirit of the season with all things glittery and shiny? I did. Though we dint bring any Christmas tree this year but the baby simply loved all the tinsels and baubles in the shops. Every time we went out he looked at all those Christmas lights with awestruck eyes. Finally when we bought some decorations to give our home a little touch of Christmas cheer, he was elated…and kept on jumping when his father finally switched on the lights. He loves glitters and glam and next year we will surely bring home a big Christmas tree for him. I saw these cookies while searching for the Mince Pie recipe in Joy of baking and instantly knew I will make these. Give me something craft-y and am in anytime. These were perfect for son’s kiddy friends who received Christmas gift hampers from him this year. But the biggest hurdle was to make it egg less, as most of them are pure vegetarians. So, I added little more butter and 1/3 cup of almond flour and the final outcome was crisp, tasty and cutesy cookies. The shaping of the cookies is a little tricky, you will fumble with the first one or two but once you get the hang of it they will become easier. Have tried to give a pictorial on the shaping but the low light in my kitchen spoils everything. Still this would give you the basic idea. Here is how I made these cutesy cookies, which were genuinely loved by the kids and their parents. Mix flour, almond flour, soda and set aside. With a electric mixer or whisk beat the sugar, vanilla, oil and butter till creamy. Mix in the dry ingredients in 2-3 batches and fold till you get smooth dough. If needed add the milk a spoonful at a time. Take half of this dough and mix in the red food colour. I used powdered colour which I dissolved to 1 tsp of milk. Cover the doughs separately in plastic wrap and chill for 20-30 minutes(if you find the dough too soft, otherwise you can make the cookies directly). With greased hands start making the cookies. First take walnut sized ball from the white dough. Roll this between your palms or on a lightly greased surface to make a 4-5” long rope. I found it easier to make 2-3 long ropes and then joing them by pressing the edges together and then rolling. Do the same with another walnut sized ball from the red dough. Place the two ropes side by side. Now by slightly lifting one side try to twist the ropes together to create spiral. Do this little at a time or you will end up breaking the ropes. After every twist check the ropes if Broken somewhere. Do this by pressing the broken parts together and rolling. 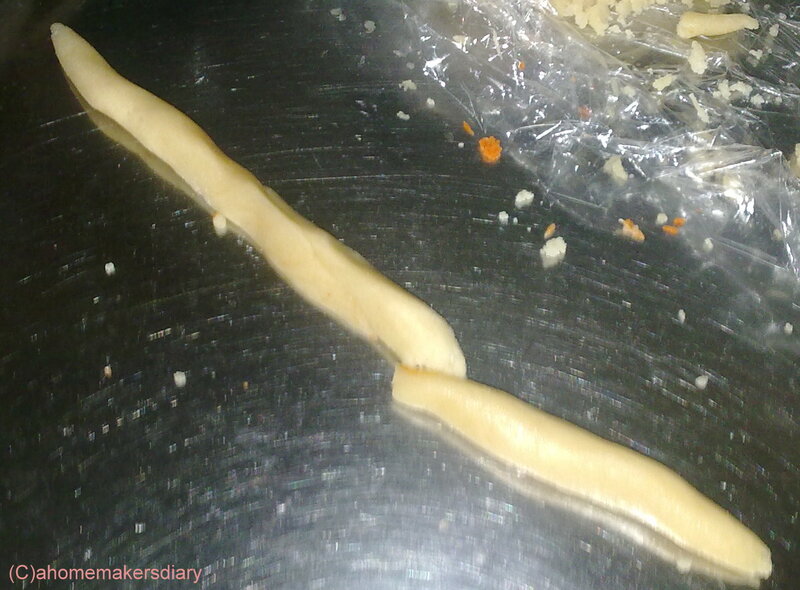 Once twisted roll it back and forth on a lightly greased surface to secure the twists and to make it smooth. Carefully transfer on the sheet and then slightly bend the top like a cane. Prepare the other sticks and place them an inch apart on the baking tray. Bake the cookies for 8-10 minutes (mine were ready in 8 minutes), check after 5 minutes if the sides are browing fast. If so adjust the heat. Cool them on wire rack and store in airtight container. Don’t bake them on greased foil as the heat from the foil will make the bottom dark brown. The colour of the cookies is brighter when not over baked so please be extra careful to check the cooking time. The cookies would be soft even after baking. Be very careful in transferring. You can see the original recipe (with eggs) HERE. 3. Its the time to Jingle again at Asan khana. Gosh ..... Candy Cane cookies look soo cute and perfect. Like they say hard work n patience pays .... you proved it gurl. Luv every bit of it. Beautiful candy cane cookies.I love the colors . Looks so cute and delicious.. thanks for the recipe !! wow candy cane cookies they look fantastic and I am sure they taste super too. gr8 pictures and a gr8 recipe too! Hey the candy canes are really cute...hard work always pays Sayantani, WEll done!! How sweet they look super cute.. nice idea ..beautiful decor. Wish u Happy new year dear. 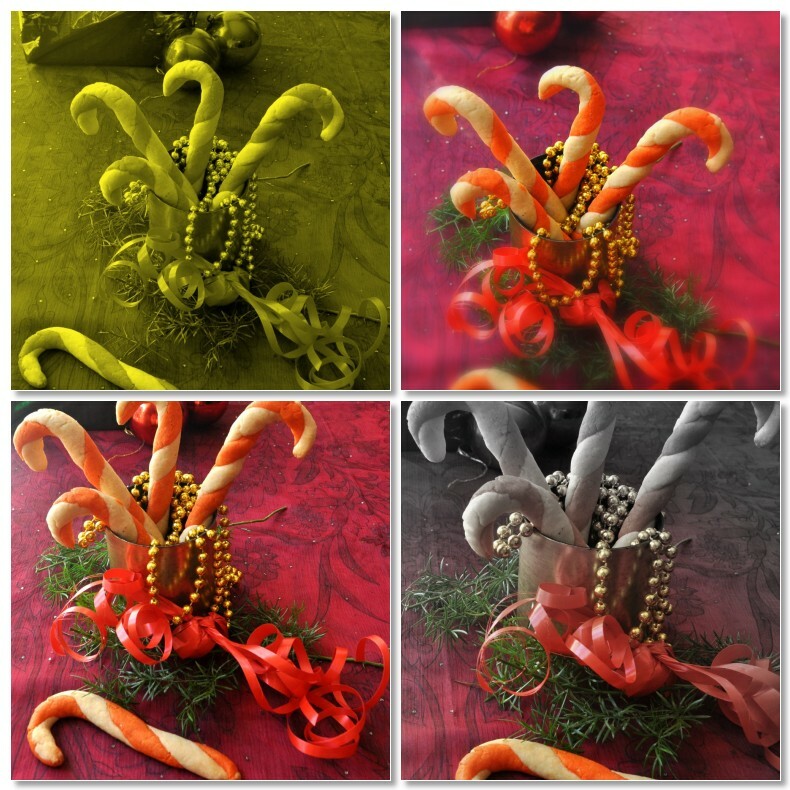 Candy cane ..made at home! wow! excellent dear. Seems you had a wonderful Christmas. So cute! wow, those are simply amazing..my kiddo will love these! Sayantani those are so adorable! Indeed your type artsy :D. One question while baking do they retain the round stick shape or does the resting side get slightly flattened? Yours look rounded but curious to know. Thanks for sending these cute cookies to my event! this is new for me,..
@anjali, yes the backside is very flat. but just a little part of it. 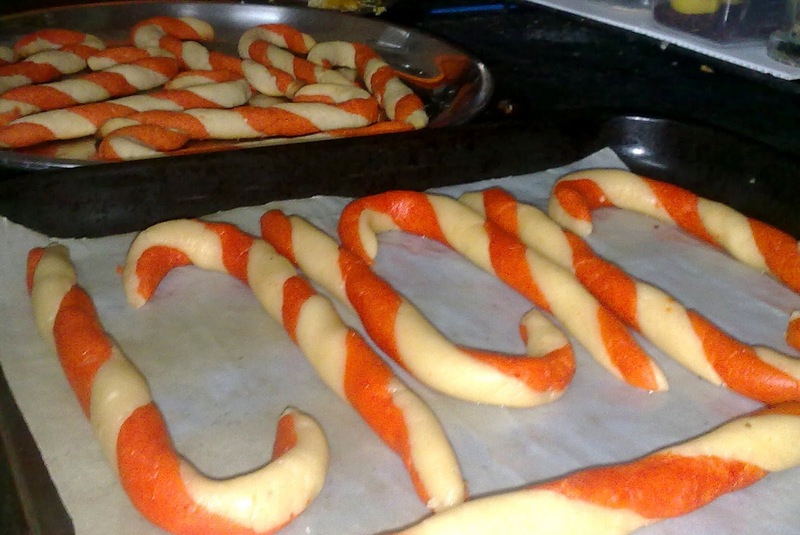 Adorable candy cane cookies,soooooo prefect..
Candy cane cookies look so nice. Bookmarked..
Sayantani Yet they are awesome and your pics highlight them perfect! So cute and perfect Candy cane cookies. Have a great new year Sayantani! wow..cookies look so cue and delicious...nice..
Wow,so pretty they look,great effort! Love the fact that its eggless! A big thanks in advance from my kids, Sayantini :) They are going to love these cookies.